Massachusetts citizens can now buy a TASER gun! On Tuesday, April 14th, 2018 the Massachusetts Supreme Judicial Court struck down a state law that bans regular citizens from owning stun guns and Taser devices. The court ruled unanimously that the law violates the United States Constitution's Second Amendment, which gives Americans the right to bear arms. Please note that owners of a Taser device must be at least 18 years old and possess a firearms license, Massachusetts ID, and MA Basic Firearms Safety Course certificate. This may seem strange, as Taser devices are not considered as firearms, however, the lawmakers felt that if a citizen is qualified to carry a firearm, they would use a Taser responsibly. Click here to view all available models! Save the TASER Pulse, TASER Bolt, TASER M26c, TASER X26c, and the TASER X2. 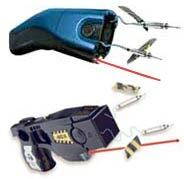 TASER devices are extremely effective in neutralizing an attacker! All five of the TASER models we sell are geared to not only inflict pain on aggressive assailants, but totally incapacitate them as well. 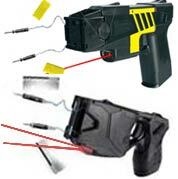 Watch this video of the TASER X26c in action! Click here to see more TASER videos!